Master Tarot readings in one hour! 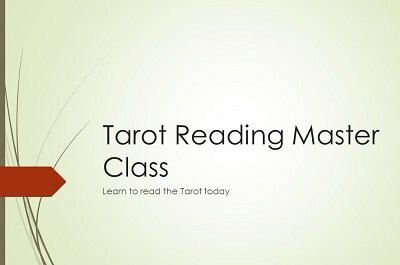 Give me one hour and I'll show you how to give amazing readings with the Tarot. If you have ever wanted to give incredibly detailed Tarot card readings but were daunted by how many cards there were, or if you were frightened off by the thick books of detailed meanings (I was!)... then this video will be a huge relief for you. Imagine holding a person completely spellbound, hanging onto your every word, and finally being completely shocked at the incredible accuracy of a reading that you gave them. Yes you. My name is Jesse Lewis and I can teach you the Tarot in one evening. Quite frankly, some of the folks I've taught have commented that their sitters think they've been giving readings for years! Best part: my system is so easy that you'll have a hard time forgetting the meanings. And after only a few readings you'll be giving beautiful readings that flow like a river. Add to this, your natural intuition (and yes, you do have it), you'll be shocking, amazing and helping folks for fun or for profit. For Fun and For Profit - What to do, what NOT to do. One Woman Learned the easy way to read tarot from the first section and gave her first reading 15 minutes later. Now, I confess, that is a fast learner. But you will learn faster than anywhere else. You'll be giving amazing readings in no-time-flat. And you can forget about the competition. I'll fast-track you and show you how to soar like an eagle with powerful, direct and amazing readings. I bet you're wondering, how much does this all cost? Well, my minimum fee for a reading is $45.00. My sitters get tremendous value for that price. For the knowledge you'll be getting and a little practice, you too could charge and make back ten-fold whatever I charge. It's tremendous value. It's loaded to overflowing with information that you'll master in 2 nights (but probably less). If you have ever wanted to master the Tarot, you need this Video series. Order today! 1st edition 2016, length one hour. After the many tarot books I have read, always finding these books unclear about how to actually read a card for a querent, I was truly pleased to find Jesse's "Tarot Reading Master Class", because, at long last, I had found an approach to reading the cards that was practical and would make sense to both the reader and the querent. Without plunging deep into the depths of the symbolism of ancient mysticism in every tarot card, The "Tarot Reading Master Class" smoothly gives the reading from Jesse's unique method, which is as functional as it is fun, and for reading the cards is all you need for the job and is an indispensable tool for the mentalist.